Warrenton, VA (July 31, 2018) Essentials of Community Risk Reduction is a new, free, online course where fire fighters and officers can learn the basics of Community Risk Reduction that they can use on the job every day. USFA Report Titled Safety and Health Considerations for the Design of Fire and Emergency Medical Services Stations. Sunday May 20, 2018 marks the beginning of National EMS Week and presents an opportunity to honor the men and women who deliver pre-hospital 9-1-1 emergency medical care throughout the United States. This vital public safety service is provided primarily by cross-trained, multi-role emergency responders who are based in our nation’s fire departments. STILLWATER, Okla. – It was December 2, 2017 when a house filled with smoke in Guthrie. The two people inside were able to escape, thanks to smoke alarms installed just three months prior by the Oklahoma Assistive Technology Foundation (OkAT) AFG grant and Nick Mueller, OSU Fire Protection alumnus. 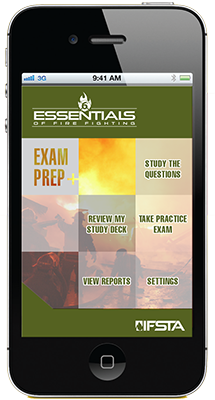 STILLWATER, Okla. – The Essentials of Fire Fighting, 6th Edition Exam Prep Plus App created by the International Fire Service Training Association (IFSTA) at Oklahoma State University, has ranked in the top 20 among all downloaded educational apps on the App Store and Google Play.